EDITORIAL: Time to lighten up on marijuana – Cannabistical: of or concerning cannabis. Anyone looking to buttress the argument for decriminalizing marijuana in New Jersey should take a close look at a new American Civil Liberties Union report regarding the War on Pot. To sum up: It’s a needless fight being waged badly. Pot arrests have been rising steadily under Gov. Chris Christie, which shouldn’t be a surprise. Christie continues to regard marijuana as a gateway drug to harder substances, and dragged his feet on implementing New Jersey’s medicinal marijuana law. Christie’s compassion and enlightenment regarding drug addiction and how best to combat it seems to stop at opioids. But it’s not just the apparent crackdown and the costs — about $143 million a year to enforce marijuana laws, the ACLU estimates — that are so troubling. Arrests also continue to disproportionately target blacks by a large margin, and appear to be far more focused on users rather than dealers, even though the latter should be the bigger concern. It’s worth noting that the ACLU does have an agenda here, since the organization supports legalizing pot. But that doesn’t make its findings any less true or compelling. Law enforcement is wasting far too much in time and money chasing down pot users — and likely doing so in a discriminatory fashion. Fortunately there’s an expiration date on all of this — the day Christie is no longer governor. Christie has stood firm against the growing momentum for legalization. But lawmakers have a legalization plan teed up for a new governor, as well as the all-important taxation element that would raise new revenue and serves as the primary motivating factor. The pot landscape figures to change in New Jersey regardless of the November victor. Democratic gubernatorial nominee Phil Murphy strongly favors legalization, and with a Democratic-led legislature by his side, action would likely be swift. Lt. Governor Kim Guadagno, the Republican challenger, is more cautious, but doesn’t appear likely to maintain Christie’s hard line. She’s supportive of expanded use of medical marijuana, and says she’s open to decriminalization — which would avert jail sentences for small-time recreational users. 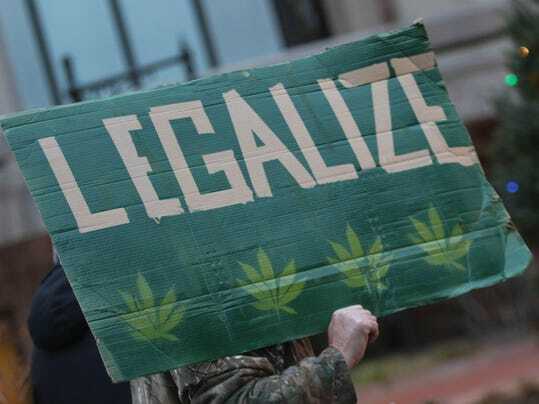 Public opinion, however, continues to trend toward legalization in some form. Seven states, as well as Washington, D.C., now allow recreational pot, albeit with some differing limits; four of those states approved legalization last November. Studies in Colorado and Washington, where marijuana has been legal for longer periods, appear to have shown no surprising or alarming consequences, although some critics have offered their own more negative interpretations. In the end, we can find more reasons to decriminalize marijuana in New Jersey than to oppose it.